Dave Hanson makes music focused on the laid back blues songs of the past and Blind Faith is the ultimate testament to that. It’s a completely feel good, sing along anthem and is destined to become an instant favourite due to its catchy chorus and soul driven guitar riffs. Accompanying the song is a joyful video that goes perfectly with the single, a focus on summer and the happiness it brings. Although on first glance his name might not be one that’s too familiar with you some of his work definitely will be. Dave Hanson previously played guitar and wrote songs for The Dunwells. A hugely successful group who in the past toured with Mumford and Sons, Sheryl Crow & Amos Lee, performed on the ‘Tonight Show’ with Jay Leno and scored a number of US Top 40 singles. A successful career by any feat. However, never one to sit on his morals Dave Hanson decided to break off on a solo career to venture into the world of creating and performing single-handedly and we’re certainly glad he did. Hanson has created a new EP called Blind Faith which focuses more on a laid back blues sound compared to his previous work. The lead song from the EP is the album titled ‘Blind Faith’ and comes with a video to go alongside the feel good anthem. Sunshine and dogs, it’s hard to think of two words in the English language that humans respond so well to. Throw in beautifully soulful acoustic music and you know it’s smiles all round. Luckily you don’t have to wait until Summer roles back around before you can experience all 3. 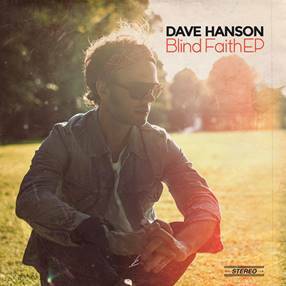 Just go over to Dave Hanson’s video for his new single ‘Blind Faith’. It’s feel good from start to finish, with blue’s fuelled guitar riffs, inspired by the soul filled blues songs of the past. The mellow harmonies and Hanson’s soothing voice results in a combination ideal for the video that accompanies it. The uplifting feel of Stealers Wheel’s “Stuck In The Middle With You” mixed with a T Rex vocal sounds. This may be his first solo project and as he sings “there’s plenty of life in the old dog yet” we can only hope he’s referring to himself and the long awaiting successful solo career than stands before him.